You can determine the amount of oxygen in a compressed-gas cylinder by reading the volume scale on the high-pressure gauge attached to the regulator. You must be able to reduce the high-pressure gas in a cylinder to a working pressure before you can use it. This pressure reduction is done by a regulator or reducing valve. The one basic job of all regulators is to take the high-pressure gas from the cylinder and reduce it to a level that can be safely used. Not only do they control the pressure but they also control the flow (volume of gas per hour). Regulators come in all sizes and types. Some are designed for high-pressure oxygen cylinders (2,200 psig), while others are designed for low-pressure gases, such as natural gas (5 psig). Some gases like nitrous oxide or carbon dioxide freeze when their pressure is reduced so they require electrically heated regulators. 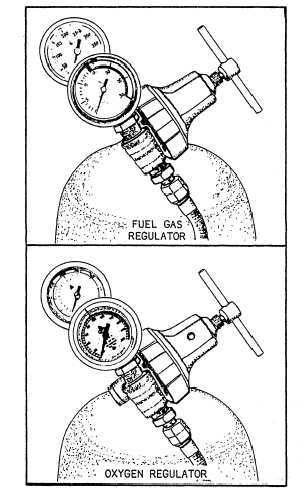 Most regulators have two gauges: one indicates the cylinder pressure when the valve is opened and the other indicates the pressure of the gas coming out of the regulator. You must open the regulator before you get a reading on the second gauge. This is the delivery pressure of the gas, and you must set the pressure that you need for your particular job. psig (this acronym means pounds per square inch gauge). When the gauge on a cylinder reads zero, this does not mean that the cylinder is empty. In actuality, the cylinder is still full of gas, but the pressure is equal to the surrounding atmospheric pressure. Remember: no gas cylinder is empty unless it has been pumped out by a vacuum pump. There are two types of regulators that control the flow of gas from a cylinder. These are either single-stage or double-stage regulators. Figure 4-8. - Single-stage regulators. not made to withstand the high pressures that oxygen regulators are subjected to. IN (clockwise) allows the oxygen to pass from the high-pressure chamber to the low-pressure chamber of the regulator, through the regulator outlet, and through the hose to the torch. Turning the adjusting screw further clockwise increases the working pressure; turning it counterclockwise decreases the working pressure.